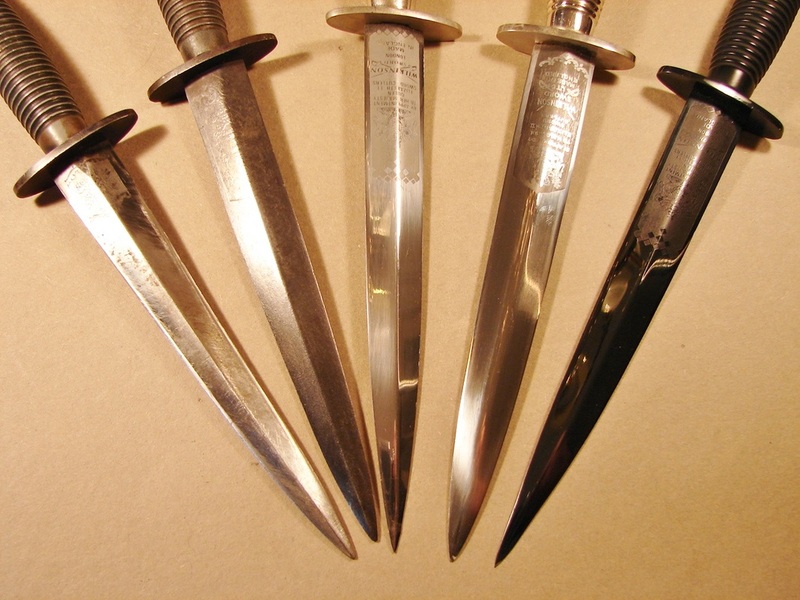 Below: Two nice Third Pattern knives, top one from the 1950s and the lower one a WW-II version from the 1940s. The top one is nickle plated while the bottom one has lost all of its original black coating. 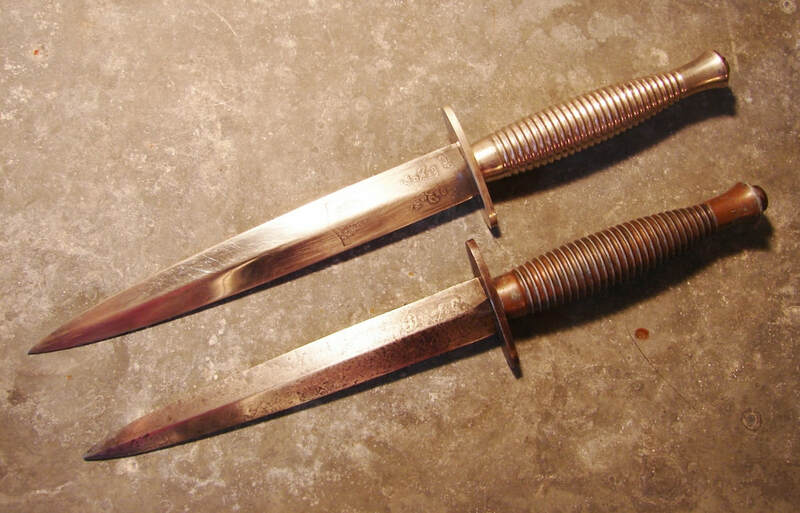 Below & Left: A standard WW-II Third Pattern Wilkinson knife. It is nice and tight but missing all of the black finish off the handle. The blade has staining on the side with the logo and yet is almost completely clear on the back side. As usual there was no sheath with it and no story. Etched WW-II third patterns are fairly rare out of the many hundreds of thousands of P-3 produced. Only by accident did I notice the remnant of an F-S logo on the back side of the blade. The faintness of the etching now leads me to believe this side was polished out at some earlier date nearly erasing the logo. The top nut is not messed with nor does it have any clamp marks. The knife is all original. Since very few of the knives exist with the original black finish on the handle I can only assume that whatever they used was not a good solution to darkening the handles. 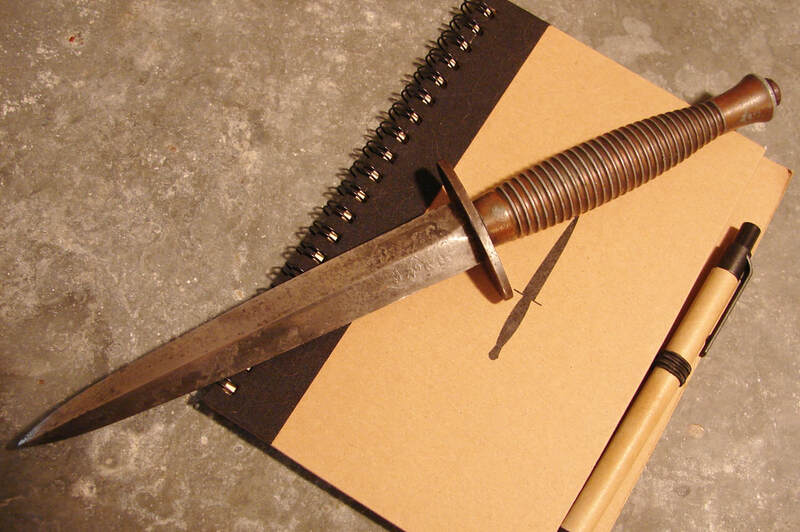 This would have been a very attractive knife when it was new, back in the later years of the war. Many men complained that the Third Pattern handles were slippery when wet with perspiration or blood. I do not think the grooves enhanced gripping, and in fact, may have made them harder to grip. Of all the Fairbairn-Sykes designs, the Fatman with its coarse knurling, may have been the best. 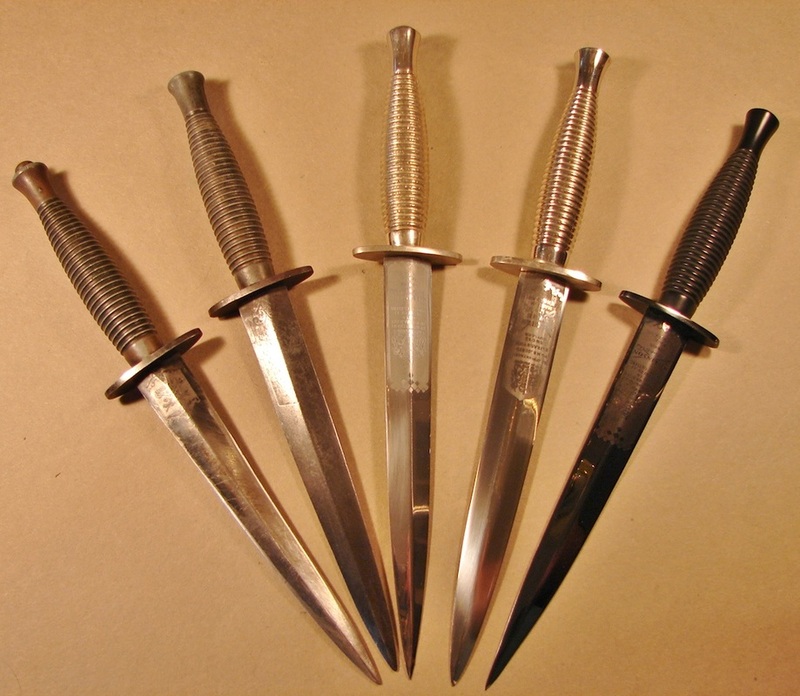 This photo shows a mixture of eras, WW-II, Korea, and Modern Wilkinson F~S Third Pattern Fighting Knives. Starting at the left is a WW-II issue knife with the small Wilkinson etch. This etch is very light as is the F~S one on the reverse side. The F-S etch on P-3 knives is very uncommon. Left: This is a long "Masonic" etch, with the Queen's coat of arms, but different from the last years of Wilkinson production. The blade has seen some better days and is patinated from rust and neglect. This is the best photo I could get of the beautiful etch. 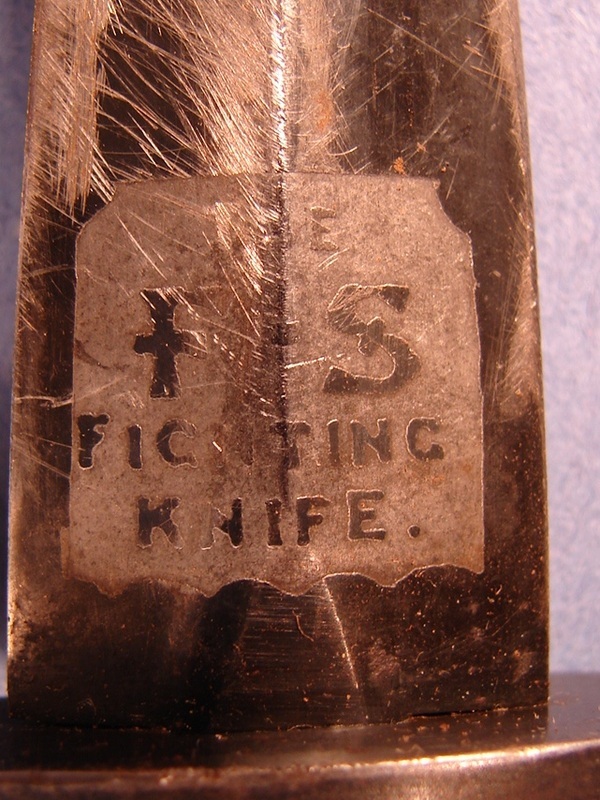 Typical of later production knives it no longer has the F~S etch on the reverse side of the blade. The long triangular flat near the guard indicates it is one of the heavier blades. Second from the left: is what I believe to be a Korean War vintage knife. I could be all wrong and if anyone has specific knowledge of the dating of specific Wilkinson logos/etchings please contact us. Second from the right is Nickle plated with the newer, long etch, which includes the coat of arms. There is no F~S on the reverse side. The tip of the blade is badly wrinkled, something I have seen on several of this vintage knives. 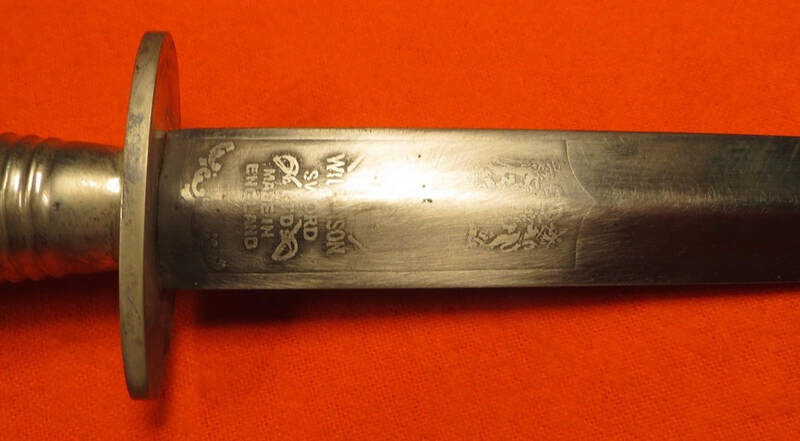 It appears that Wilkinson tempered these blades softer than during WW-II where the blades normally snapped off rather than wrinkled. Below: Bare steel, polished blade. Note the simple pointed top edge of the etched panel. Middle Knife: This is a later period knife that I bought new but I cannot remember the year. Note the change to the top of the panel to include the fancy diamond shapes. This was the last etch used by Wilkinson, as far as I know. I also bought this knife new in the 1970s I believe. This is another nickle plated knife, handle only. Below: Bright Nickle plated blade. 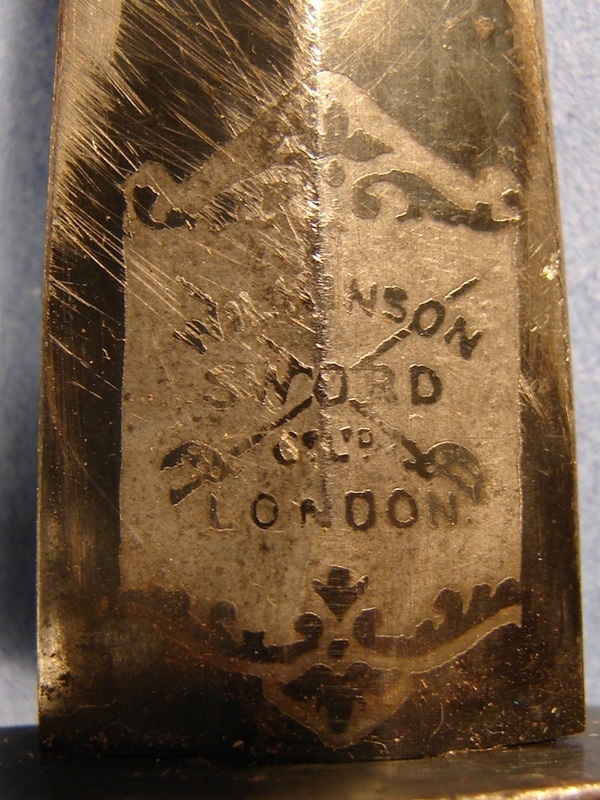 Below: A spray of the Wartime and Post War Wilkinson third pattern blades.